Evan Taylor left his acting career behind five years ago without looking back. He’s always been more comfortable around horses than people—especially Hollywood types. His new life training racehorses is a dream come true, but increasing financial problems and an abusive boyfriend have him doubting himself and his choices. 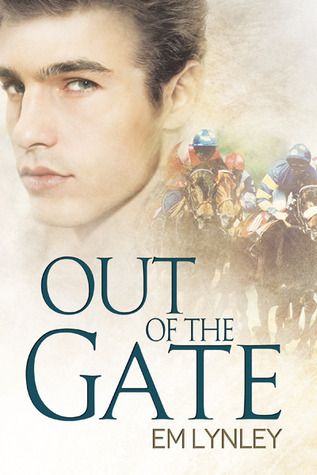 Then Wes and his friends buy a third-rate racehorse—partially for publicity—and send him to Evan’s stable. Wes’s friendship with Evan soon develops into an overpowering attraction he can’t act on. He’s never met a man like Evan, but if there’s any chance for a future together, Wes must choose between a career he loves and the man he adores. I love a good surprise, don’t you? This was a damn good surprise and it wasn’t just one, they kept coming. I do not like non-con or dub-con. *warning* A nasty dub-con scene is thrown at us right from the start. It was unpleasant and I wished it hadn’t happened, but *surprise* it truly was necessary. I don’t care for liars or make believe relationships, but *surprise* I understood the reason for the beard in this case. I think the author took on an extra challenging conquest by *surprise* not taking the easy way out; which easily could have happened. Lynley took the difficult road and the final destination was that much sweeter as a result of the harsh path it took to get there. Horses. I’ve read my share of cowboy stories and loved them, but racing horses? This was a first. It was fabulous and brimming with great information. I can’t wait to go to the track someday! I reveled in the surplus of details about racing and race horses, it was extremely entertaining. Bravo on research. A beautiful horse brings two men together. The chemistry is instant, but obstacles stand in their way. For one, Evan is in a relationship, an abusive one at that. Second, Wes is holding steadfast to his path as a man in a relationship with a woman. It seems impossible that they could be together, but they find strength and considerable power in their magnetic attraction. An up-and-coming actor and a retired face from the Hollywood shouldn’t be from completely different worlds. Yet they are….or appear to be. Demons from the past shadow their future. Neither knows much about the other but plan on changing that. Fame, fortune, fears and failure are mingled together. The action will keep you on your toes….the desire will keep your heart racing….the emotions will tug on your heartstrings. The characters are deep and genuine. The writing is smooth and constant. The story-line is lively and strong. A bit of a slow burn between the two men, but the emotions are abundant. They run into a great deal of drama, but most of which would be spoiling if I mentioned. I can assure you though, you certainly won’t be bored. They prove happiness may require bloodshed to reach, but it’s worth every drop. They prove circumstances may not be ideal, but once you yield to love your dreams can come true. They prove that love can conquer all. It was a gorgeous rush to the finish line. Come on over, surrender, and enjoy the race…it’s a good one. This entry was posted on June 19, 2014 by BioB in Contemporary, Reviewer: Sheri and tagged 4 Stars, dreamspinner, em lynley.